I’m not the only one who sees the danger. Mega-investors Warren Buffett, Bill Gates, George Soros and John Paulson are all running from the supposedly "strong" U.S. dollar like scalded dogs before it’s value is stolen right out from under them. I am writing to you today because the next four years will be “more of the same” for your money. It will continue to be stolen because Trump won’t have the time — or maybe even the power — to stop the theft. So it is vital you act on what these billionaires, a former Federal Reserve Chairman, and even a past Treasury Secretary are already preparing for. The U.S. dollar is on a steady downward death spiral from carefully hidden inflation. This stealth inflation continues to slash the buying power — and steal the value — of millions of unsuspecting Americans’ life savings. Unlike the inflation-ravaged 1970s, today’s official government statistics have been systematically gutted. If you’ve had that feeling, then it is time to listen to that little voice in your head and take the action I am about to suggest. I need to rush you our new mega-manual, Ultimate “End of the Dollar” Defense Manual: How to Hedge Against — and Prosper from — the Great Hyperinflation Deception. It contains MUST-READ red-hot information on how to protect yourself. Details on getting it FREE are at the end of this letter. Hidden inflation is a threat to your future comfort, big time! It means your stock portfolio is worth less than you think. It also reduces your future ability to pay for fuel, electricity, food, health care, and other basic daily needs. And it is especially merciless to people who assume they can live comfortably on a fixed income. Respected forecaster George Whitehurst-Berry has explained in more blunt language: “We are in the terminal stages of the world’s most gigantic pyramid scheme,” referring to the inflationary wave now impoverishing millions while making a handful of smart and ahead-of-the-curve thinking investors rich. You deserve to be just as protected against the coming inflation wave as Warren Buffett and Microsoft Chairman Bill Gates — that’s why I want to send you the inside information and strategies they already know, before it’s too late. As this Special Subscriber Briefing shows with shocking urgency, now is the time to make basic preparations to come out ahead in the collapsing value of dollar-denominated assets — to not be a victim or a sucker. I have no intention of being either, and I know you feel the same way. 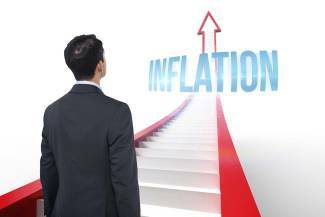 At the end of this letter I will tell you how to get the newest, most authoritative source of information about hidden inflation, how it is ripping you off, and what you can do to protect yourself. The Ultimate “End of the Dollar” Defense Manual is probably among the most important guides I have ever offered. You can’t find this information anywhere else and you haven’t a moment to lose. In America Today — Bar None! Shockingly deceptive government statistics that will make your blood boil — on a scale unprecedented in our history. All designed to encourage millions of uninformed U.S. investors to keep their money in highly-vulnerable dollar-denominated financial instruments only. Even when everyone in the know is running for the exits. Virtually unreported dire warnings from America’s top investors and former top government officials. Even the Comptroller of the U.S. confirms what investors and steadily-rising gold prices are pointing to: The impossible financial pickle the government finds itself in. Understand all the NEW options you have to protect yourself from the coming inflation tsunami — far above and beyond what smart people had in the 1970s to make themselves rich even as most Americans saw their life savings ravaged by inflation. The government’s secret manipulation of the gold market downward — and why hiding grim inflation statistics from millions of investors is coming to a nasty and brutish end. I don’t like being lied to. And I don’t like being ripped off. So the first step is to understand the government’s shocking financial dilemma — how serious and unprecedented it is and how they are making “their” problem into “your” problem. (At least if you don’t act quickly). Since the 2007-2009 financial scare and great Recession, the Federal Reserve has been quietly printing trillions of dollars and expanding credit to “pump up” the U.S. economy. Yes, it propped up the stock market but further diluted the real value of all dollar-determined assets — especially stocks, bonds, and mutual funds. You see, by watering down the value of the dollar assets, it is much easier for federal bureaucrats to pay off their massive unfunded liabilities and other obligations. Here’s the rub: Congress has saddled taxpayers the equivalent of $614,286 in credit card debt per U.S. family of four (according to the Government Accountability Office, newly published data shows that the federal government has amassed $76.4 trillion in debts, liabilities, and unfunded Social Security and Medicare obligations). How do they meet these obligations? Simple! Print dollars. Okay, fancy phrases like “currency readjustment” and “monetizing the debt” don’t really sound so bad. But you should know they’re words designed to confuse you: they just mean inflation. The dollar has lost more than 92% of its purchasing power since 1971 — when you could buy the best car on the dealer’s lot for a mere $4,000. Financial Sense University analyst Mike Maloney notes it took almost 45 ounces of gold to buy one share of the DOW in 1999 — today it takes less than 20. In other words, if you sold one share of the DOW today, you could buy only 19 ounces of real money — that’s a hidden DOW crash of 58%. 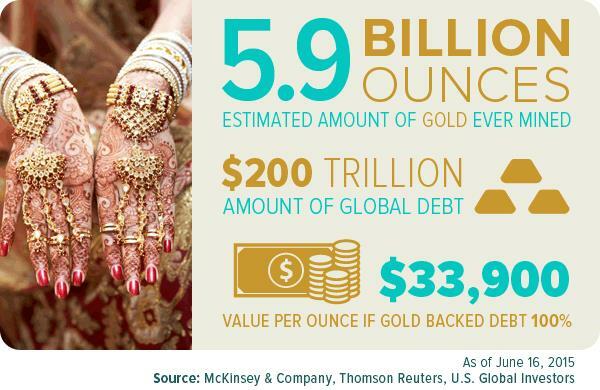 If gold backed the world’s debt today, many credible experts believe it would be worth nearly $34,000 an ounce! (Which is why a little farther down in this letter I am going to tell you about a highly-secretive Treasury agency that does nothing but manipulate the price of gold downward — to prevent retail investors from realizing the growth of the DOW is little more than an inflation-driven statistic, and not a reflection of wealth creation). In early 2006, the Federal Reserve Board stopped publicizing its “M3” statistic — the broadest, most accurate official indicator of money supply and future inflation. The move was seen by respected “Fed watchers” as a sign of strong inflationary pressure. What’s ominous about the cloak of secrecy slapped on M3 is the Fed still collects this data, but is now actively hiding from Wall Street, the bond market, and millions of investors just how much artificial credit (phony money) has actually been pumped into the economy. Under the Clinton Administration, the CPI inflation index stopped using straightforward arithmetic and substituted something called “geometric weighing,” essentially giving government bureaucrats the “wiggle room” to substitute hamburger in the place of steak when steak prices shot through the roof. In short, government officials use “geometric weighing” to artificially understate CPI numbers to the investing public. 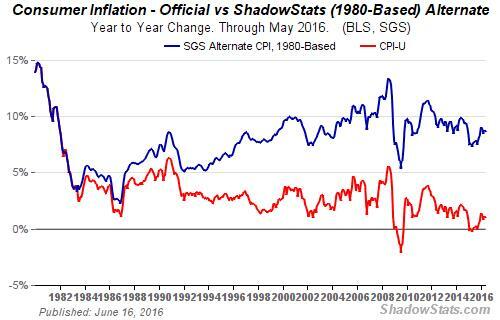 Another CPI inflation deception is the “cherry-picking” of data. Wall Street pollyannas frequently cite “core” annual inflation numbers as “proof” inflation is under control. In reality, energy and food are not counted in the month-to-month numbers — or year-over-year numbers. Leaving out food and energy make it appear inflation is much lower than it actually is. Of course all these fancy deceptions are not entirely lost on all Americans. We all know about thieves stripping copper from constructions sites, and how nickel and zinc and copper are so expensive it costs more to make our coins than they’re worth. Metal values have soared and the hard value of the dollar has plunged. 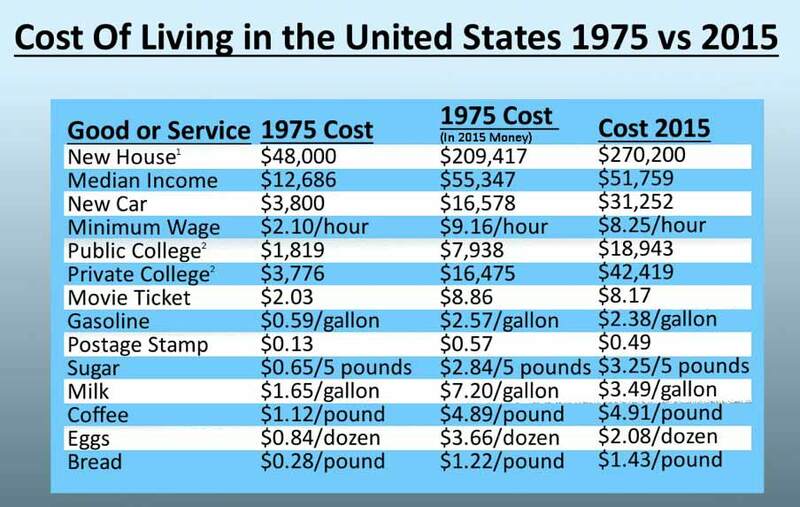 Even in today’s dollars we have tremendous inflation just since 1975… and we get paid less. I’m not even going to show you the cost of living chart since the turn of the century because it will make you very upset. 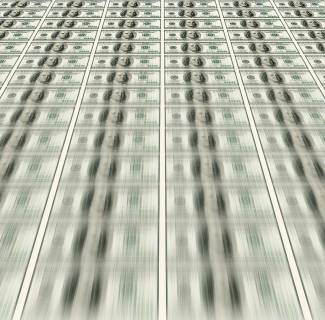 Did you know that today’s dollar can only buy about 7% of what it could buy in 1900? Compare that to gold, which today buys 150% of what it could in 1900. Gold has skyrocketed to 75 times as much purchasing power as the dollar. The government’s inflation deception is even uglier than what I’ve told you so far. To protect the illusion Wall Street dollar-denominated assets are “rising” in value, a highly-secret quasi-government agency known as the “Exchange Stabilization Fund” (ESF) works with other governments to artificially force the market price of gold downward. The Exchange Stabilization Fund answers directly to the president and treasury secretary with little Congressional oversight (in fact members of Congress I’ve spoken with seem to know nothing about the ESF). The ESF directly intervenes in the gold market by aggressively buying and selling the precious metal to prevent it from finding its “natural price” against the DOW (which many experts believe is $2,000-$3,000 per ounce). In 2001 the Fed stopped referring to the ESF in its public statements. But in 2005, Fed officials mistakenly published minutes of old meetings in which the ESF was mentioned. The document confirmed what Treasury officials have denied for years: ESF actively manipulates the price of gold downward on the international market. Despite ESF’s efforts, the market price of gold has risen 200% since 2001. The government’s hidden inflation numbers strongly suggest gold is vastly undervalued and will eventually find its true level of worth no matter what federal bureaucrats do to suppress its natural “float” price. The bad news is most Americans are in for a rude awakening. Especially when they realize the core value of their life savings have been gutted, and what dollars they do have buy far less gas, food, health care, and other hard basic essentials than they have been counting on. It will make the 1970s look like a picnic. What this all boils down to is the value of your assets is under systematic attack through hidden inflation, which allows the government to service its massive obligations with cheap fiat currency. The conditions are now ripe for a “perfect storm” of massive dumping of less valuable dollars, further inflating the already too-liquid U.S. money supply. Once Americans and foreign holders of U.S. debt realize how debased our currency has become — and China has already begun the process — the accelerated dumping of U.S. dollars could easily have catastrophic consequences for you if you are caught flat-footed. So now that I’ve explained the problem, let me tell you about YOUR PERSONAL SOLUTION. For over a year my research staff and I have been busily preparing a brand-new manual with a practical, easy-to-implement game-plan appropriate to inflationary times, the Ultimate “End of the Dollar” Defense Manual. What really motivated me to do this project is one of the biggest myths I have seen in years: The false security of “diversification.” Your broker and the Wall Street media tout the value of diversification — and in theory they are right! BUT mostly their diversification is limited to dollar-denominated stocks and bonds. Never forget — anything denominated in dollars loses its purchasing potency with each passing month. What YOU need to know about is true diversification — among currencies, stock markets, financial instruments, and precious metals which are not tied directly to the sinking dollar. Yes, most brokers recommend investment in many sectors of the U.S. economy but this is of little value if ALL your investments are tied to a declining dollar and inflation which artificially pumps up the “value” of dollar-denominated Wall Street assets. Wealth Creation and Protection, NOW! You absolutely need my just-off-the-presses blockbuster, Ultimate “End of the Dollar” Defense Manual: How to Hedge Against — and Prosper from — the Great Hyperinflation Deception. Today there are many MORE options in the form of financial instruments and tactics that can preserve the value of your assets. So instead of wasting time you really don’t have for thousands of hours of research, you can get all of these options at your fingertips right now. This manual is not a “report” that complains and informs but little else. It shows you how to prosper — especially if the coming inflation tsunami is as devastating as the indications suggest it is going to be. Even better, it is designed to help you without having to make radical changes to the way you live or invest. Quite simply, it is the very best insurance policy money can buy. Of course, there are lots of “gold bugs” out there. Heck, I’m one too! This manual also goes far beyond precious metals. You need a comprehensive strategy to not be ripped off by the government’s inflation deception — not a bunch of theories, but practical steps you can take right now so you are not left holding the bag. I guarantee even if you have an inflation-hedged portfolio, there is a great deal to learn in our inflation manual. Everything you need to know, I promise. Where savvy investors such as John Paulson and Warren Buffett are placing their assets to prevent them from being eroded by inflation and a declining U.S. dollar. How to avoid the coming nightmare millions of people on fixed incomes now face: Rising costs of everyday needs across the board, and a smaller retirement nest egg capable of buying far less. Special Analysis: Who is killing the dollar, and how they are doing it… by crumbling the “Three Pillars” that have protected the U.S. economy. Are we being paid off for our silence on Hyperinflation? No, you don’t have to liquidate your assets to buy the protection of gold! Here’s how to act, where to buy, how to protect, and more! How to use the little-known “bypass trust” — an incredible tool even if you fall below the estate tax threshold of wealth — and why ignorance about it can be downright dangerous. 8 GREAT ways your family can help you shield your assets and protect them from hyperinflation AND the government. The “Rule of 72’ that savvy investors use to know how much their money is really worth, PLUS, three steps you must take right away to prepare for a possible banking collapse. Shocking details of America’s true financial situation the government is trying to hide from Wall Street investors — you need this information now before it becomes public knowledge. Simple steps to TRUE diversification in an inflationary environment — using all new financial instruments not available to investors during the 1970s. The REAL reason your savings aren’t safe (Is the government coming for your money?) and what you can do about it starting today! Easy steps to take so you can begin living outside the system and preparing for coming collapse. Learn the critical gold ratio signaling an uptrend that the big boys use — and you too can get rich. The shocking truth about the dollar — our fake promissory notes — that the Fed probably doesn’t want you to know but it’s knowledge you must have. How smart investors are quietly “hedging” like the pros to beat the money creators at their own game. The 10 best places to go offshore with your wealth so the government can’t get at it — and the flimsy reason they use to try and seize it! The 10 worst investing mistakes you can make that could cost you a fortune. How to use the secret onshore tax haven and wealth builder used by the privileged, corporations, and the very wealthy. How to lower your taxes and get leverage against the government in retirement. The information in Ultimate “End of the Dollar” Defense Manual cannot be found anywhere else. Were I to make this manual available to the general public, the price would need to be $299 or higher. But in the interest of getting the word out to my cherished family of subscribers — the people I answer to — I’ve worked out a far better arrangement. Ultimate “End of the Dollar” Defense Manual is designed for people like you — savvy, right-thinking Americans who want to protect themselves without going overboard. That’s why I’m willing to make you this special limited-time offer to get you a copy of this manual, for ONE-THIRD the ORIGINAL PRICE (66% OFF!) — that’s only $29 while supplies last — along with my 100% Guarantee of Satisfaction. There is one thing rich people have in common. They are informed, at least about money. The reason they are informed is they read a lot. I mean a whole lot. In fact, they crave the material that interests them. And if you want to be rich, you need this report. It’s a guide to help you think like a rich person, and attain wealth the way they do… year after year… by sticking to the simple principles outlined within this easy-to-follow guide. Lloyd Darland created the Rosetta Stone of American finance by which all modern fiat finance should be viewed. Until you’ve read it, you will be flying blind! He titled it The Emperor’s Clothes Cost Twenty Dollars and in the process created the most eye-opening revelation regarding the Fed's sinister inner workings ever published. He effortlessly demonstrates how the Federal Reserve steals your money through inflation, describing the mega fraud and illegalities of a Federal Tax system that has been used to cheat Americans to this very day! When you read it, our entire economic crisis and today's political propaganda will make PERFECT sense… the authorities consider them dangerous words from a dangerous man… JUST the sort of thing Bob Livingston wants to make sure you see for yourself! How do you begin investing in gold… and how do you accumulate more in this world of increasing scrutiny and regulation against free-moving assets? To help you decide, our researchers have put together an exhaustive listing of reputable dealers in precious metals — who will protect your privacy to the letter of the law! Why on Earth are we giving away what is normally subscription-only information for FREE? It's simply the best way I know of to protect you from the coming hyperinflation. It's not a favor… I expect nothing in return. It's my pleasure to help protect you and your loved ones. You see, ALL of the information in this report was assembled and organized by my team at The Bob Livingston Letter™, a place protected from the prying eyes of the government and their media mouthpiece monopoly. Common sense still has a place at the table… and as the world and our economy, are careening towards hyperinflation, my readers consider the plain truth revealed in The Bob Livingston Letter™ as essential reading. Our readers refuse to become helpless victims of the political elite — dependent upon their charity for survival. They understand that the media, the Internet and 99 percent of all major news outlets have a hidden agenda that has little to do with their own prosperity. That’s why I want to give you the chance to join our members and subscribe to The Bob Livingston Letter™ and get ALL the bonuses I’ve mentioned absolutely free. I’m so confident your subscription will be worth 10 times more than what you pay today, I’ll add another year to your membership for free if you subscribe today. You should understand, we created this manual for our own planning purposes, as well as for my friends, family, and my cherished subscribers. That’s how I know its contents are precious and will stand the ultimate test of critical importance to you too. So I promise that when you choose to become a member you don't risk a single penny when you R.S.V.P. today. All you have to do is subscribe today and I'll rush you all these guides completely risk-free. You don’t have to be a Wall Street big-shot to benefit from The Bob Livingston Letter™ and the Ultimate “End of the Dollar” Defense Manual, either. Inflation is a hidden tax on everyone, small and large. Once you digest its contents, you will be better off than 99% of the American people. 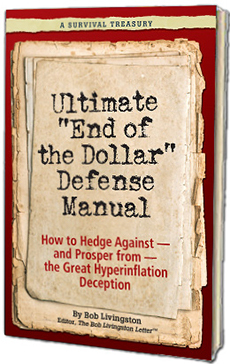 In fact once you have your copy of Ultimate “End of the Dollar” Defense Manual, I urge you to “pass it around” for the education and benefit of your friends, neighbors, loved ones — and even your own investment club. That way you can help many, many people for a minimal price! You will be doing them a tremendous service. I’m so certain you will find this mega-manual MUST-READING, that it’s backed by my iron-clad 100% promise: If you are dissatisfied for any reason with the Ultimate “End of the Dollar” Defense Manual, just return it for a full refund. After all, if the world were completely fair, no doctor would earn a dollar if his treatments failed to help you. 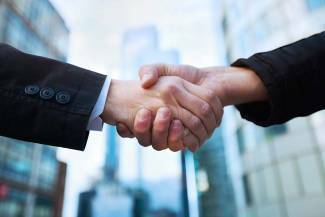 No broker would get a commission if he didn’t make you wealthier. And if I can’t help protect you, I shouldn’t keep a penny of your hard-earned money either. That wouldn’t be right, or fair. But I urge you to act quickly. By now, you must recognize the coming hyperinflation disaster for what it is. 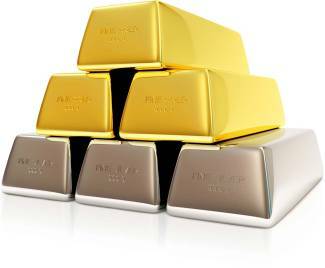 If not, how much higher do gold and silver need to rise? How many banks will have to go under? How high do food prices have to soar? Or your insurance costs? How many times will our government have to raise the debt ceiling? How much “helicopter” money do they have to drop to prop up the system? In other words, how many signals do you need before you admit there is a problem and that you need to act now? Of course, you always have three choices. One is to do nothing. You have every right to stand by and watch your assets and wealth drain away right in front of you. Two is to try and go it alone. Make your own financial preparations, create your own trusts and accounts, buy some gold and hope for the best. If that’s your choice, I wish you success… and luck! Your third choice is to get a copy of Ultimate “End of the Dollar” Defense Manual today. Now, the decision is completely in your hands. Only one of two things can happen now. Either we’ll go on from here together, or you’ll go it alone. I wish I could take the next step for you. I can’t of course; it’s completely up to you. So I hope you will act now. Once the masses realize they have been had, it will be far too late to protect your interests or benefit from the inside knowledge I want to send you. The day may come when it will be too risky to publish this limited edition Ultimate “End of the Dollar” Defense Manual. Because of the risk, we’ll be limiting the press run on this manual to 500 copies, so please get your order in early. Ultimate “End of the Dollar” Defense Manual shows you how to come out ahead of the coming inflation wave just like smart people did in the 1970s — only better. I urge you to also be ahead of the curve, just like America’s top investors and the Vice President are doing today. You deserve no less. If you don’t take certain steps, you are at severe risk of being fleeced along with most of the American people. Remember, there is absolutely no risk under my iron-clad guarantee and you have everything to gain by getting our Ultimate “End of the Dollar” Defense Manual. Order now — timing is everything! P.S. Consider my VERY BEST OFFER! Subscribe to The Bob Livingston Letter™ for two years for only $49 (24 information-packed issues). 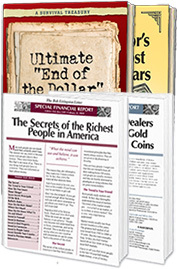 You get my Ultimate “End of the Dollar” Defense Manual PLUS a FREE book, The Emperor’s Clothes Cost Twenty Dollars, and two additional free bonus reports, Secrets of the Richest People in America and Directory of Dealers Specializing in Gold Bullion and Gold Coins. That’s four GREAT FREE BONUSES, just for becoming a member today! P.P.S. Please don’t waste a moment. You absolutely need to understand the hidden deception behind the debasement of the dollar and take defensive steps to come out ahead of 99% of the American people. My courteous operators are standing by 24 hours a day, 7 days a week. Call Toll-Free today, 1-800-319-3487! SPECIAL SAVINGS CERTIFICATE Over $200 In FREE Gifts and Savings! Best Value — Sign me up for one year (AND I get one FREE year) of The Bob Livingston Letter™ PLUS send me a FREE copy of Ultimate “End of the Dollar” Defense Manual for $187 $49, plus FREE shipping. That's 12 issues plus 12 FREE issues and savings of $118 off the total regular price. Plus, send me all three of these FREE gifts! That's $204.80 in savings and 4 FREE Gifts! Good Value — Please send me a copy of Ultimate “End of the Dollar” Defense Manual: How to Hedge Against — and Prosper from — the Great Hyperinflation Deception for $89 $29, plus $6.95 S&H. That's a savings of $60 off the regular price. Plus, send me 3 FREE gifts! That's $139.85 in Savings and 3 FREE Gifts!